The following page provides some instruction for various areas of our web site, and will be developed over time as common questions are identified. Contact us if you are having trouble with some aspect of our site. Where are my Organization Details and Personal Details? You can see information about your own details, as well as information about your company, depending on your role within the company. 2. 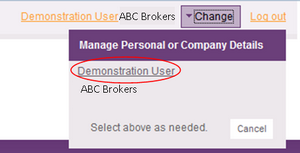 If it shows the company name, select "change" at the top right hand of the screen. In the drop down box select your name. This will allow you to see your personal details. Selecting the company name will allow you to see company details. 3. Go to the "My Prof IQ" menu to see what is available, in respect of each option.